I am a Brit who currently lives in the USA and makes her fabric spending money, I mean living, by teaching German online. 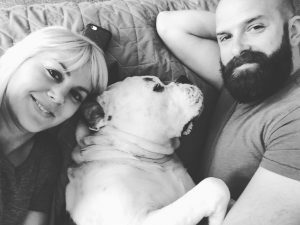 I currently live together with my two best friends —my huge American Bulldog, Randle and the normal sized human, Joe—in an RV. We’re currently parked up in Asheville North Carolina but I can’t promise that will always be where you’ll find us. What I can promise is lots of tales of sewing, both happiness and woe, successes and failures, fabric purchases, pattern disasters and probably some cute dog pics in between, oh and shots of me eating donuts.